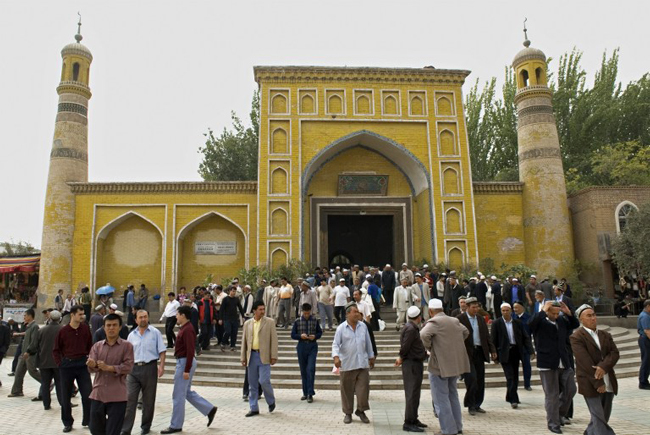 Worshippers leave the Id Kah mosque in Kashgar in northwestern China's Xinjiang region, Jan. 7, 2012. Chinese authorities will introduce a new law effective January that they say is meant to combat religious extremism in China’s far-western Xinjiang region, although experts warn it will infringe upon the rights of the ethnic minority Uyghur Muslims living there. The law, unanimously approved on Nov. 28 by the Xinjiang People’s Congress, the region’s parliament, revises a two-decades-old regulation on religious affairs and would be the first in the country to target religious extremism, state media reported. But some experts argue the more stringent regulations will only make the situation worse. “If China continues to use this so-called law to repress freedom of expression and religion, it will directly spark a deterioration in the local situation,” Dilxat Rexit, a spokesman for the World Uyghur Congress, told RFA. Among other objectives, the law would prohibit people from wearing or forcing others to wear clothing or logos associated with religious extremism, although it does not specify the types of clothes. It gives local authorities the right to ask people not to wear them. “The Chinese government believes that Uyghurs’ religious faith has thrown its rule in the region into crisis, and that is why they are pursuing highly repressive policies against it,” Rexit said. The regulations also say those who use the Internet, mobile devices or digital publishing to disseminate religiously motivated material deemed to undermine national unity, social stability or incite ethnic hatred can be fined as much as 30,000 yuan (U.S. $4,850) and have their equipment confiscated. But such regulations pertaining to how individuals impart and disseminate ideas online in ways that should cause alarm to the state are “notoriously subject to political, rather than legal, considerations,” Szadziewski said. Chinese authorities have jailed Uyghur scholar Ilham Tohti for life and some of his students for up to eight years, accusing them of running a website advocating Xinjiang's independence. Human rights groups say Tohti was a moderate who advocated for greater understanding and dialogue between various communities, and with the state. “The Internet is a powerful tool for promoting inter-ethnic understanding, as Ilham Tohti advocated, so further limits on its use damage the prospects for a genuine assessment of conditions in Xinjiang," Szadziewski said. The regulations also stipulate that people should not use religion to interfere in judicial affairs or ceremonies such as weddings and funerals. They also prohibit Muslims from practicing religion in government offices, public schools, businesses and institutions. “Furthermore, this law breaches the freedoms of religion and expression,” he told RFA’s Uyghur Service. Under such regulations, Chinese authorities can use punishment and intimidation to stop Uyghurs from disseminating or reading any opinions that express dissatisfaction with the government, Rexit said. “They use so-called laws and regulations to suppress religion, forcing it to serve the requirements of China's political ideology, and turning [Uyghurs] into political vegetables with no ideas of their own,” he said. The new law defines religious extremism as “activities or comments that twist the doctrines of a religion and promote thoughts of extremism, violence and hatred,” according to an article in China’s state-run China Daily. The regulation updates a previous one passed two decades ago by adding 18 new articles, including ones that prohibit the distribution and viewing of videos about jihad, or holy war, religious extremism and terrorism in or outside religious venues. “The old regulation, which was passed 20 years ago, just cannot handle new situations, such as the spreading of terrorist or extreme religions materials via the Internet or socials media, and using religion to interfere in people’s lives,” said Ma Mingcheng, deputy director of the Xinjiang People’s Congress and director of its legislative affairs committee, according to state media. The measure was approved the same day that Chinese police killed a dozen assailants who had launched a deadly attack using explosives and knives on civilians at a busy food market in Yarkand county in Kashgar prefecture. Also on Nov. 28, Xinjiang authorities announced a plan to recruit 3,000 former soldiers to help guard residents by joining military and police forces that patrol Urumqi. In May, Chinese President Xi Jinping announced the start of a yearlong antiterrorist campaign in Xinjiang in which authorities have cracked down on Uyghurs in response to a series of deadly attacks that they have blamed on religious extremism. Reported by RFA’s Uyghur Service and Roseanne Gerin. Translated by Mamatjan Juma and Luisetta Mudie. Written in English by Roseanne Gerin.